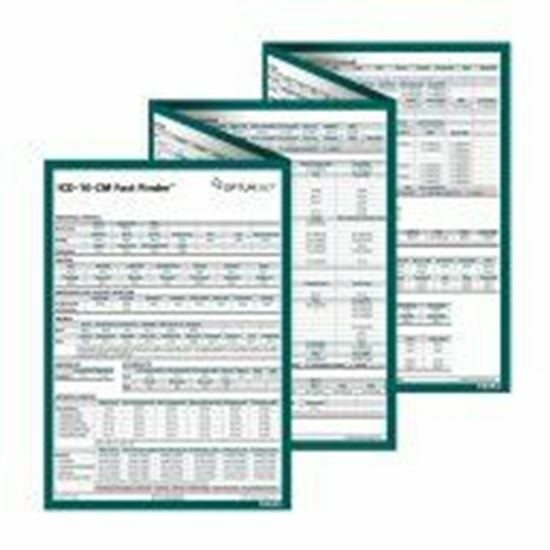 The ICD-10-CM Fast Finders utilize our Optum360 Xpress Coding Matrix with ICD-10-CM codes presented by specialty in an easy-to-use table format that maximizes the number of codes contained in the fast finder and also simplifies code selection. These convenient and reliable coding tools provide complete and valid code selections at your fingertips. Use this coding tool to determine the most specific ICD-10-CM codes for your specialty — codes that accurately identify the patient condition and level of severity as well as support medical necessity. Optum360 Edge — Optum Xpress Coding Matrix (designed and used exclusively by Optum360). Our easy-to-use, streamlined tables present valid code options for each condition. Optum360 Edge — Compact 6” x 9” accordion format. More codes, less space in our compact accordion format which provides 8–10 pages of specialty specific codes. Optum360 Edge — Alphabetically organized tables. Body systems and main diagnostic terms are organized alphabetically into tables that contain a comprehensive list of valid codes within the diagnostic category. Complete and Comprehensive Coverage by Specialty. Get expanded code selection options for diagnoses selected specifically for your specialty. Valid Codes. Code directly from the tables contained in the Optum360 Xpress Coding Matrix with confidence. Productivity tool. The logical look-up format makes finding the right code easier. Coding and documentation tool. Use these Fast Finders to drive documentation improvements under ICD-10-CM. Convenient work-flow coding tool. Rely on one at every work station. 31 specialties. Also Fast Finders for External Causes, Signs and Symptoms, and Z-codes.